There is just something special about a relationship between a mom and her daughter. I remember when I was growing up, I used to watch the way my mom moved, how she dealt with other people in public, and how the whole room would light up when she walked in. While, like every mom and daughter, we had our differences, the bond between us has only grown stronger over the years. The memories of home baked cookies after school, late night homework that we completed together, and my first formal dance when she styled my hair and applied my make-up, have only made that bond even sweeter. This year, when you select Christmas gifts for mom from daughter, forget about that big box store filled with generic gifts, and give her something that will truly touch her heart. When ordinary Christmas gifts just won’t do for your extraordinary mom, ChristmasGifts.com has just what you need. 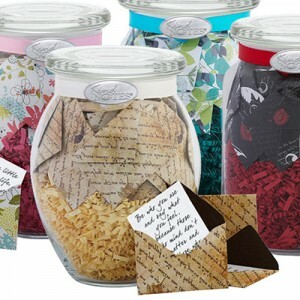 Sentimental Gifts for Mom from Daughter: If you are looking for something sentimental to show Mom how much you care this holiday season, check out these unique Jars of Notes. They are beautifully decorated jars that contain 31 personal messages that your mom can open anytime she needs to feel close to you. Other great ideas include personalized gifts for her like photo frames (don’t forget to include your favorite photo), magazine covers that feature your fabulous mom and her best traits on the cover, and even casserole dishes (hey, maybe she’ll take the hint and cook you up some comfort food). Jewelry Gifts for Mom from Daughter: Choose from personalized pendants and bracelets to one of a kind mother’s rings, dazzling earrings and customized jewelry boxes this holiday season. With such a variety of wonderful jewelry items here at ChristmasGifts.com, you are certain to find the perfect piece that reflects your mom’s unique personality. Relaxing Gifts for Busy Moms: Nobody works harder than your mom. Show her that you appreciate all of those long hard hours she’s dedicate to her family with spa gifts she is certain to love. Treat her to a massage gift certificate, a day at the spa, or if your budget is tight this holiday season shower her with a bath and body gift basket filled with lotions, body sprays, bath oils, a unique bath sponge, a few candles and a bathrobe. Gifts for Moms that Keep On Giving: Show your mom how much you adore her all year long with a gift of the month club gift. There is a wide variety of monthly clubs to choose from, so whether she is a health nut, a gourmet treat fanatic, a foodie, or a wine enthusiast, you are sure to fine the perfect match. Choose to have your gift delivered every month, every other month, or every three months for as long as you like. Gifts that Create Special Memories for Mom: Your mom has always put her family first, now isn’t it time that she enjoyed something special for herself? Experience gifts are the perfect solution to help Mom get away from it all. Consider things like city tours, sailing, dinner cruises, and even hot air balloon rides and show Mom the time of her life this holiday season.